Ski holidays in January are perfect if you are looking for a bargain to one of the top resorts of the Alps. There are cheap ski holidays at the beginning of each year to resorts such as St Anton, Lech, Val d’Isere, Meribel, Courchevel, Verbier... the list goes on. The formula is quite simple; January is considered low season as there are generally too many beds and not enough heads wanting to book them. Consequently the tour operators price the month of January lower than any other month in the hope that they can entice adult groups to book into their committed chalet beds. To boost their marketing power they will often offer generous discounts as well as other incentives such as free lift passes or ski hire deals. Snow conditions are generally at their best in January when the air temperatures are consistently below freezing. This maintains the pistes in pristine condition while those who like to ski off-piste should find plenty of fresh powder. You may need to wear a few more layers to battle the cold but with fewer people on the mountain there are no lift queues and the slopes relatively empty. Over the years we have learnt which chalet operators get their January pricing strategy spot on, managing to fill their low season weeks at full brochure price even before the winter season starts in early December. However, other companies get their pricing wrong and end up having to discount their January weeks on a last minute basis in order to sell remaining chalet bed stock. Although the most popular chalets and hotels will always fill with early booking guests there will always be plenty of deals to be found if you leave your holiday booking to the last minute. A ski holiday in January can be one of the best holidays giving you perfect skiing conditions, empty pistes and low prices as well as tempting offers, if you manage to snag a late deal bargain. January never sells out completely so there are always some great last minute chalet holiday deals to pick up. As we work with over 150 different ski holiday companies we are perfectly placed to show you the best deals. We would not recommend waiting for a deal if you are booking a large group but for smaller groups of 2 - 8 people waiting to book your ski holiday can prove to be very rewarding. January is traditionally the month that tour operators tear up brochure prices in an attempt to fill beds that remain unsold. We recommend the best time to book, if you are deal hunting, is 10-7 days before you travel. This means calling us to start your holiday research two weeks before you intend to start your holiday. You can leave it even later than this and you might find an even better deal as a result but booking in the last few days leading up to your departure can be a fraught and tense experience. The last few remaining beds might be very cheap but they have a habit of being snapped up in front of your/our eyes by someone else. Blink and you'll miss the opportunity to book. Hence why we advocate booking 7 - 10 days before you go. The booking process is far calmer and you will still be assured of a great bargain. Why are there no January ski deals for hotels? Ski tour operators sell one (or a combination) of three basic holiday types: chalet holidays, self catering apartments and hotel holidays (either on a bed & breakfast or half board basis). Chalets are rented for the whole season and paid for in advance, and for those chalet companies that offer a flight inclusive packaged chalet holiday flight seats will also have been purchased from a charter airline in advance. The plus side of this financial commitment is that by buying flight seats early and in bulk volume, and paying rent on a chalet for the whole season (usually with 50% paid in advance) a holiday company will be able to purchase these elements at a good price. This enables them to market a competitively priced holiday which, when sold, still makes them a healthy margin/profit. The downside of committed flight seats and chalet beds is that if a chalet week passes without being sold the costs to the operator are high. Resort staff still need to be paid, the flight seats which may have cost £150 each are not used and the chalet rent still has to be paid. A ten person chalet that is unsold for just one week might cost a tour operator as much as £7,000. factor in marketing costs and other in UK expenses and the figure is more. This is the reason that chalet holidays are sometimes discounted on a last minute basis. It is better for the holiday company to sell cheap and cover their costs (flight seat, chalet rent etc) than make no income at all. The reason why the same principal does not occur for hotel or self catering holidays which are also packaged with committed flights is that 4 weeks before a departure date a holiday company can 'release' any unsold accommodation back to the provider (the hotel or apartment owner). Thus tour operators are not financially committed to hotel beds or apartments in the same way that they are to chalets. And as they are not committed there is no need to discount - any unsold beds are simply returned. Of course releasing unsold hotel beds (or apartments) means that potential profit will not be made but at least there is no heavy financial cost to bear. However, what of the flight seats you may ask? A tour operator selling hotel based package holidays must surely be committed to their flight seats just as they would be if selling chalet holidays. This is why tour operators have flight buying departments that spend a lot of time forecasting what future sales might look like. A tour operator selling packaged hotel holidays will only buy enough flight seats to cover what they are very confident of selling. This is why if you book a hotel based holiday late a tour operator may have to buy in extra flight seats at a premium - hence the flight supplements that clients are sometimes asked to pay. 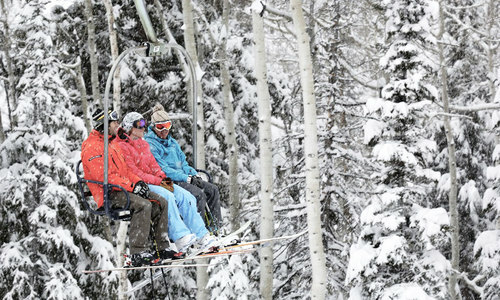 January is by far the best month to book a ski weekend. Hotels, like chalet companies, also struggle to fill their beds in this low season month and are therefore prepared to sell their rooms for a short weekend break, rather than their preferred 7 night rotation of Saturday to Saturday. We might also be able to book hotel rooms for a short stay in mid March but the high season periods of end December, February and early April are pretty much off limits for a ski weekend. We have been organising ski weekends for over 20 years and know the best resorts and hotels to suggest. If you are considering a ski weekend do call us for some advice and a quote. Read more about ski weekends and short breaks.